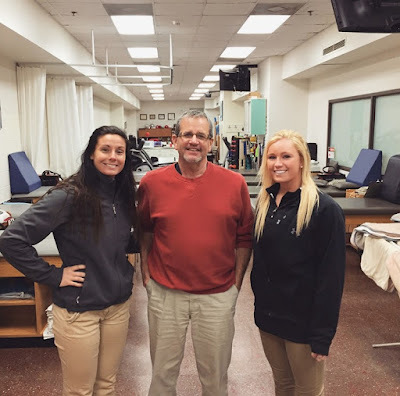 During my time spent at Washington University, I had the opportunity to observe Jim Anderson BS, ATC along with three of Saint Louis University’s Master’s Program students; Andrea Strebler (pictured), Jack Dunlap and Demeisha Crawford (not pictured). 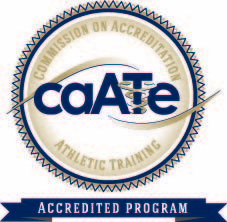 Jim is not only an incredible mentor, but comes with a wealth of knowledge and experience in the field of Athletic Training. As the head Athletic Trainer of the St. Louis Rams for 27 years he offers an incredible perspective of the field of Sports Medicine, not to mention great stories. Washington University Athletic Trainers are kept busy with the caliber and intensity levels of their athletes, which provided me with a great opportunity to observe and ask questions regarding the various techniques and methods of care they provided. I was able to observe some of the therapeutic modalities, immediate injury care and first aid, and a variety of taping procedures. Jim, Andrea, Jack and Demeisha all possess a great skill set and were tremendously accommodating to my observing and inquiry of their practice. It was an enlightening experience being able to work with the Athletic Training team at Washington University and is inspiring to me as I move forward in my journey to become an Athletic Trainer.